$23 for 2 Fandango Tickets & $50 in Dining Dollars! (Can be Used at McD's, Papa John's + Many More!) $75 Value! You can get a great dinner and a movie deal at KGB Deals right now! 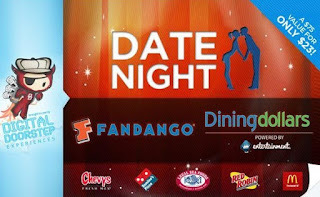 For just $23, you'll get 2 Fandango movie tickets and $50 in Dining Dollars! I LOVE Dining Dollars because I can actually use them! Restaurant.com is pretty limited in restaurant selection (for my area anyway), but Dining Dollars can be used at popular spots like McDonald's, Dominos, and 1000s of other national places. They can also be used at 100s of local restaurants! A huge $75 value for only $23! Thanks so much Jamie. I didn't know you couldn't check it out without signing up!